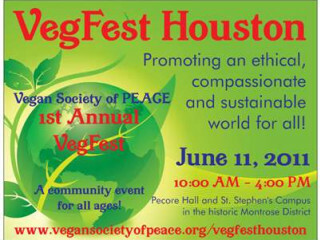 The First Annual VegFest Houston Community Festival is designed to promote an ethical, compassionate and sustainable world for all. It features vegan food vendors and food sampling from local vegan restaurants, as well as guest speakers, educational films, food demonstrations, booths for exhibitors and nonprofits, live acoustic music and a Kids Zone with activities for children. There will also be free product samples, coupons, literature, recipe booklets and prize drawings. The festival is open from 10 a.m. to 4 p.m.